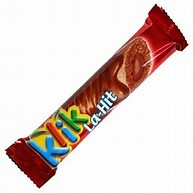 klik la-hit: a fine milk chocolate crispy bar, filled with nougat. kosher dairy cholov yisrael. made in israel. net weight 1.23 oz.